Yesterday, the Gasconade County Republican published this important story about Missouri's Rock Island Trail State Park. 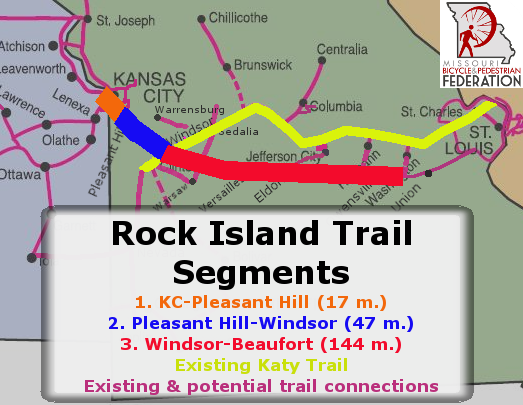 The city of Belle was set to develop the first 1.1 miles of the Rock Island Trail State Park between Windsor and Washington. What has MoBikefed done for you lately? When we ask Missourians to join MoBikeFed or support our work, they often--and very reasonably--ask: Why should I support your work? What have you done recently that effects me and my community? The Missouri Coalition for Roadway Safety is launching Pedestrian Safety Awareness Week today. The Missouri Coalition for Roadway Safety will launch a new week-long campaign focusing on pedestrian safety Monday. The campaign aims to educate pedestrians and drivers about safety. Statewide, from 2013-2016, 347 pedestrians died and 1,021 suffered serious injuries. . . . Creating safe and accessible crossings of major rivers for Missourians who walk and bicycle is one of the top priorities of the Missouri Bicycle & Pedestrian Federation and our allied organizations across the state. Recently we teamed up with Trailnet, the St. Louis regional advocacy organization that support bicycling, walking, and active living, to send a joint letter of support to MoDOT about a very important Missouri River crossing for people who bicycle and walk: The Missouri 370 bridge between St. Louis County and St. Charles County. 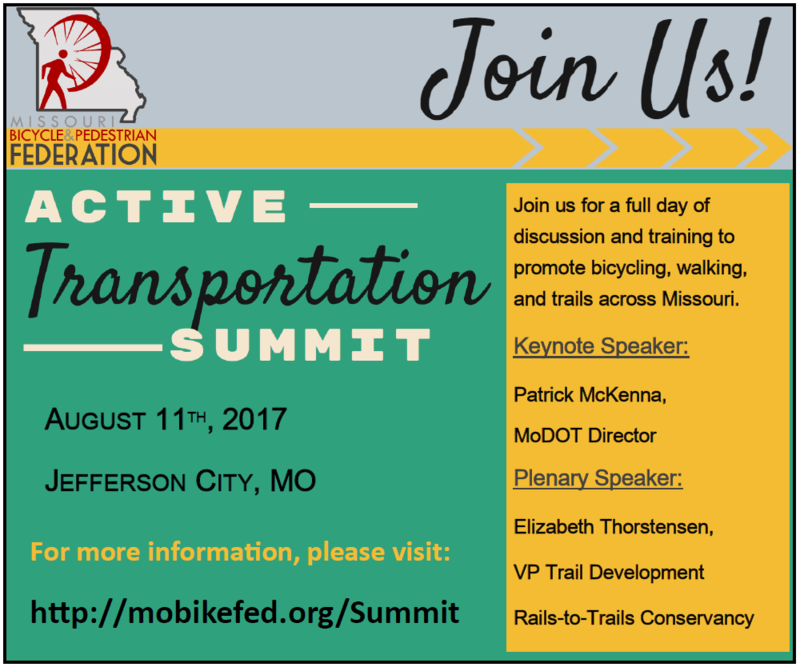 Announcing the 2017 Missouri Active Transportation Summit August 11th in Jefferson City - Join us! HB 293, the "Fair Fare Passenger Safety Act" sponsored by Rep. Galen Higdon (R-Buchanan/Platte Counties) recently passed the House by a vote of 103-46. HB 293 has made no progress in the Senate this year, so with less than 5 hours left in the 2017 legislative session, the bill is certain to stop there, without being passed by the Senate or signed into law by Governor Greitens. Still, this is the most progress a texting while driving bill has made in the Missouri General Assembly since the prohibition on texting while driving for drivers under 21 years of age was passed by the Missouri General Assembly in 2009. So we should take a moment to celebrate this small victory--and start planning for future years. If you would like to help, a short note of thanks to Rep. Higdon for sponsoring HB 293 would help a lot. Contact information is on Rep. Higdon's web page. Today House Continuing Resolution 47, sponsored by Rep. Kevin Corlew of Kansas City, passed the Missouri Senate by a vote of 33-0. MoBikeFed and our allied groups across the state have worked hard to ensure the HCR 47 was about transportation funding in Missouri--not just highway funding. Highways are, of course, an important part of Missouri's transportation picture. But funding for good, safe places for Missourians to walk and bicycle are just as important, as is funding for public transportation in Missouri. The original version of HCR 47 was focused on highway funding only. After testimony and discussion with Rep. Corlew by MoBikeFed and our allies from across the state on this issue, the updated version of the resolution was more broadly worded to include all types of transportation funding. 2017 Legislative Session: With one week to go, what is the status of key bills affecting bicycling, walking, and trails? With just one week left in Missouri's 2017 legislative session, we have had some really important bills moving--some very good and some very bad. Where are they now? 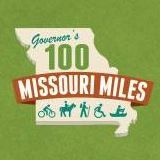 It looks the effort to stop Missouri State Parks from accepting the Rock Island Trail corridor has been turn aside, several bad bills that could effect bicycling and walking have been stopped or never introduced (always the best outcome), and the General Assembly could take one small step towards address state transportation funding. Details follow . . .
HB 698, sponsored by Rep. Pietzman of Troy, has just passed the Missouri House by a voice vote. The bill prevents Missouri State Parks from purchasing any new land until all current deferred maintenance is up to date. As we warned in a previous article, and discussed with legislators yesterday at our annual Capitol Day, HB 698 as originally drafted would have prevented State Parks from accepting the 144 miles of the Rock Island railroad corridor that Ameren is prepared to donate to Missouri State Parks later this year. Supporters of bicycling, walking, and trails in Missouri visited Missouri's Capitol Monday for the 14th annual Bicycle & Pedestrian Day at the Capitol. We held our annual legislators ride and rally and visited the office of every Missouri state elected official with an information packet about our legislative priorities for 2017. The advocacy efforts of the Missouri Bicycle and Pedestrian Federation's Capitol Day on Monday centered around four issues — the foremost was support for an anticipated expansion of the Rock Island Trail, likely threatened by a bill to limit acquisition of land for state parks. "It's an amazing investment in rural communities we don't want to miss," the federation's Executive Director Brent Hugh said of the trail's expansion. Bicycle and Pedestrian Day at the Capitol is coming up soon--Monday, April 10th, 2017. What are the most important legislative issues we are working on--and that participants will be discussing with their state legislators Monday? One of the most important reasons we advocate for more bicycling, walking, and trails in Missouri--and a reason that every elected official can understand--is because they are important to our economy.